Trieste features a Mediterranean climate with and is actually Italy's smallest province. Standing on the north-eastern coast of Italy, in the Friuli-Venezia Giulia region, Trieste is close to the Slovenia border and experiences hot summer months with contrasting cold winter weather - known for its cold 'bora' winds. Occasional frosty weather can be expected in Trieste during the winter season, particularly in January and February, when infrequent snow flurries and not unusual. The weather and climate in Trieste is influenced by its coastal setting, alongside the Adriatic Sea and resembling a secluded bay. Summer highs often reach 28°C / 82°F or more, although the winter months are much colder. However, winter frosts are unusual with daytime temperatures averaging 5°C / 41°F. The autumn months of September, October and November are amongst the wettest, although on the whole, the weather is still favourable, with temperatures averaging 17°C / 63°F. 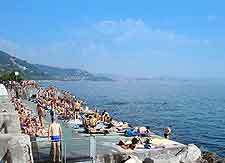 The average annual daytime temperatures in Trieste are around 15°C / 59°F.